It's that time of the week, when you get to have a little glimpse into the life of another SEND Star. The people I'm introducing are all bloggers who share their story in some way and who all have in common the fact that they are parents to children with Special Educational Needs and Disabilities (SEND). It is amazing that they found time to answer my questions at all, so please do show a little comment love or pop over and like their Facebook page; every little helps as they say and these writers mostly carry on in the hope that they are making a difference. My name is Vaila, I’m now approaching the middle of ‘the new 30s’ :D I’m a full time parent (and carer I guess, but I still mostly think of myself just as a parent). My husband and I have just celebrated (surviving until!) our 10th wedding anniversary. We live near Cambridge with our two children, daughter EJ (6 years old) and son EW (3 years old). We currently inhabit the SEND world through my daughter EJ, as she has significant global developmental disabilities & sensory processing issues. However I do believe that disability is not binary, everyone is different (some more than others of course) and I believe we all have SEND to some degree. For example in our family, the grown ups also manage to cover dyslexia & OCD/anxiety disorder to name but two non-typical traits! I guess this could mean our family is less ‘normal’ than others – but I’m really not so sure!? EJ doesn’t have an official diagnosis. Which, after struggling through and feeling pretty isolated for her first 18 months or so, we have since found out is a pretty common state of affairs for children with genetic conditions! – Who knew!? Just after EJ’s first birthday we met the community paediatrician at the Child Development Centre for the first time, and she put us on the path to meet a whole host of different specialties, from ophthalmology to orthotics, audiology to physiotherapy. EJ was also referred to genetics and she has been intermittently undergoing tests ever since (chromosome analysis, micro-array, MRI, EEGs….)! She is now 6 years old and has been on a detailed genetic study called Deciphering Developmental Delays (DDD) for around 4 years, but as yet no overarching reason for her GDD & sensory processing has been identified! EJ is now in Year 1 at a special school. Eighteen months ago we agonised over the decision on which school would be best for her. Where possible I’d always choose inclusion. However on visiting several schools, including our lovely mainstream village schools, and several special schools, we knew straight away that her school would be the perfect fit! EJ has no formal communication (or at least not that we understand……yet!?) but it has been pretty clear from the excited bouncing in her wheelchair, and the lovely big grins when we drop her off, that she knows exactly where she is! Even after the long summer break she she was able to show us that she was raring to get back to ‘work’! We’ve been really happy with the school. They have been great at keeping us up to speed and inviting us in to school events & activities, which includes me swimming with EJ once a week! This is such lovely way for me to spend some 1:1 time with my first born baby girl (yeah ok she’s 6 now but they’ll always be my babies! ), while the little guy spends some time socialising with his little friends at nursery! It would have been quite a shock to the system otherwise, sending EJ off to school after an intense period, pre-school, where I was pretty much solely responsible for a full schedule of appointments and therapies! As I say, we’ve never had that definitive diagnosis moment, but we have had difficult and rather confusing consultations in which it was never really made clear that it’s actually pretty common for children with a genetic condition to get an all clear on the tests they have currently available! It was never spelt out to us (given EJ’s symptoms) that it was highly likely she had some form genetic disorder no matter what the results of the genetic tests. We were left feeling confused, even neurotic and paranoid. I now have mixed feelings about the need for a diagnosis. A label. I have to say I feel a lot more relaxed about it since finding the support of SWAN UK (Syndromes Without A Name) who host a fantastic online forum for families of children with undiagnosed conditions. Once we realised we were not alone, indeed there were lots of us in a similar position, I think the feeling of fitting in helped to remove (some of) the feeling of needing to constantly scrabble around for answers. In many ways I think no diagnosis can be a positive thing. We are lucky in that EJ has no pressing medical needs, so we (and everyone else around EJ) can just 'get on' with giving her the best opportunities possible for her to develop in her own way - she is simply our unique little girl – no preconceptions. However there are lots of other reasons why having a diagnosis is important. A diagnosis could give us some vital information about potential health and development issues that may occur in EJ’s future. It could allow us access to a support network of other children and families with the same diagnosis and similar challenges, perhaps an exchange of ideas on particular therapy options, health issues and help in planning for her future independence (or not). Also from a totally administrative point of view, it would give us something to enter in the box marked 'diagnosis' in the myriad of forms we have to fill in to access therapy, education, funding and give us a nice quick response to the quizzical looks from new people we meet….. ‘Undiagnosed genetic condition with developmental and sensory processing issues’ is quite a mouthful! Tell us a bit about why you started blogging. I’m an architect, a non-practicing one now although I am still registered & chartered! My background is mostly home design (both newbuild and refurbishment). Although I’ve always been interested in accessibility and inclusive design, my new role as mum (and carer!) has given me a different perspective on just how much difference accessible and inclusive design can make, and has highlighted to me just how absent it seems to be as a concept from the general home design media! I initially started the blog to follow our own adaptations journey. How we want our home to fit around our whole family, be inclusive, not just a shoehorn job of adding ‘disabled facilities’ in isolation from the wider context of ‘home’. 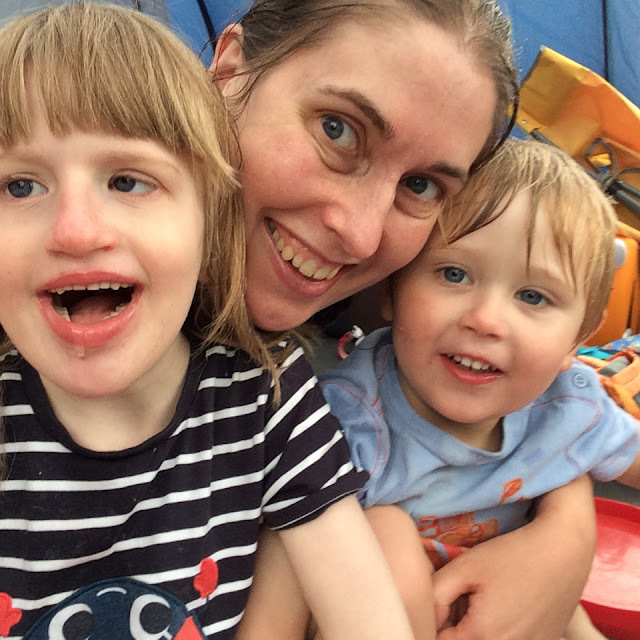 The blog has evolved a bit more into sharing ideas and campaigning for better accessible design in general, as well as a bit about our family life, including inclusion in the social sense, not just products and buildings. The main themes I tend to write most, of course, are ones we have direct experience of, namely houses and toilets! - Most homes are not very accessible – so even if your own is adapted, it’s unlikely the homes of your friends or family are! I think we need to make accessibility mainstream! Get it out there as a must have in home design, just like eco-design has become! - The disabled adaptations process is extremely confusing – even for us, who have lots of experience of home alterations projects! - When it comes to disability, what happened to style!? – disabled people and their families still want well designed things and I love finding examples of good design to share on my blog and/or on my social media! - Accessibility when out and about is far from perfect and one of my main campaign issues is improving awareness around better accessible toilets (like Changing Places) for people like EJ who need help in the loo. I love to hear experiences of accessible design (good and bad) to help gather information and ideas and to raise awareness in the product design, architecture & construction world. Please do get in touch with any stories or examples you know about! Vaila's blog is www.theinclusivehome.co.uk. You can also find her on Facebook at Inclusive Home, Twitter @inclusivehome and Pinterest at InclusiveHome. Go check it out!